My brother and his wife recently renovated their home, and not only do they have an absolutely beautiful kitchen, but the master chef skills to match. They are quite the team in the kitchen, and when they get creating, you’re in for a delicious treat. Their dishes are always big flavor. And they even create cocktails to match! I was fortunate enough to be invited over for dinner the other night when they created this Asian Sobo Noodle dish, Seared Ahi Tuna on the grill, and Saketinis. Let’s just say I’m already looking forward to my next invitation! Boil a pot of water, and cook the noodles according to the directions on the box. Heat up the grill in preparation to char the green onions. Brush the green onions with olive oil and season with salt and pepper. Place the bunch of green onions onto the grill, turning often. Keep an eye on them to ensure they get a char, but don’t burn. Once cool enough to handle, chop into 1/2 inch length strips. In a large bowl, add the edamame, shaved carrots, & grilled green onions. In a separate bowl, mix the soy sauce, sesame oil, rice wine vinegar, olive oil and chili oil. Please note these are estimates on measurements – please adjust to your liking and spice tolerance! 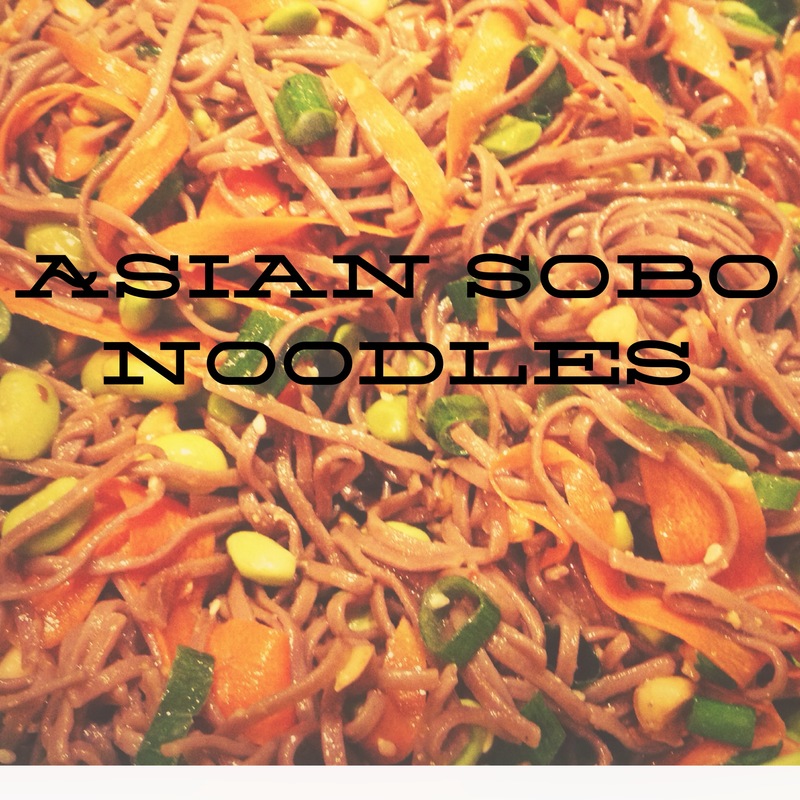 Add the soho noodles to the vegetables, drizzle the sauce over the noodles, and mix well. Add the sesame seeds & peanuts and mix. This dish can be served hot or cold. 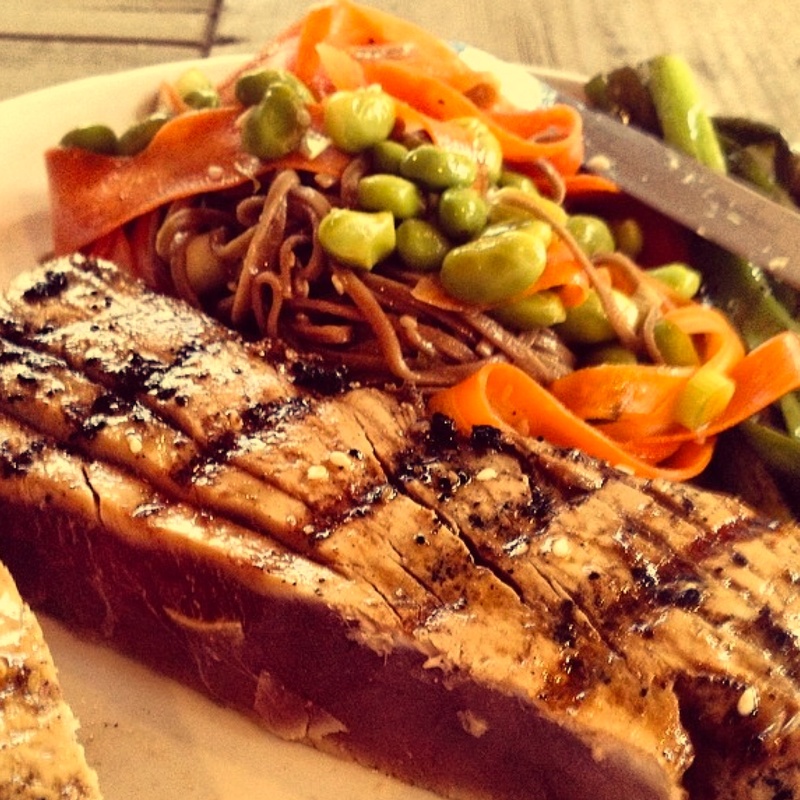 Serve with Seared Ahi Tuna and a Saketini!